The accused Chandrakanth Varma (33) told police that he was carrying the cash as per the instructions of his employer K Chandraprakash. 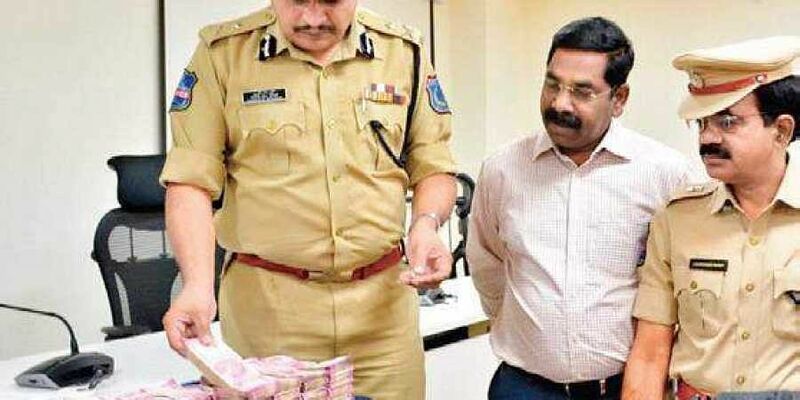 HYDERABAD: As part of checking flow of unaccounted cash for the upcoming Lok Sabha elections, Rachakonda police seized `70 lakh hawala cash concealed in a specially designed jacket, that was being transported into the city from Chhattisgarh. One person working for a diamond jewellery store was arrested and the cash was handed over to Income Tax department for further investigation. The accused Chandrakanth Varma (33) told police that he was carrying the cash as per the instructions of his employer K Chandraprakash. Two days ago, Hyderabad police seized `90 lakh unaccounted cash from traders at four different locations in the city. According to police, Chandrakanth Varma is working in a jewellery shop at Jubilee Hills as marketing agent. Ten days ago, he brought `33 lakh from Sunil Soni of Raipur and handed over to his owner Chandraprakash. On Thursday, he again went to Raipur and collected `70 lakh from Sunil Soni. He concealed the amount in a specially designed jacket and started back to the city. Meanwhile, on Saturday, LB Nagar Special Operations Team was conducting vehicle checks at RK Puram crossroads, intercepted an auto in which Chandrakanth was travelling and found unaccounted cash.